Kasumi Aika is a vice-president of the student council. 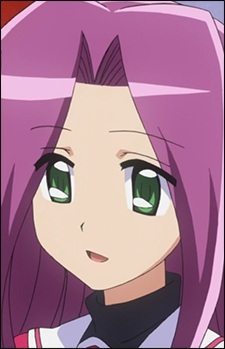 Like many other Hakuo Academy students, she comes from a rich family.While she may be seen as a sweet, kind, and gentle girl to most people, secretly she is also very manipulative and takes advantage of any situation she sees, a fact that only Hinagiku and Chiharu are aware of. (She has a notebook with the weaknesses of anybody she meets written down) Despite this, she does care about her friends and would never betray them. For example, when she learned that Chiharu was secretly working as a maid for Sakuya, she hid this secret from everyone despite the fact that she wrote it in down in her weakness notebook in order to remember it.